General Elections are just around the corner. The role of elections in ensuring a vibrant democracy and a progressing nation cannot be underplayed. For the incumbent government, elections present an opportunity to showcase their achievements and also promise a path of continuity of policies. For the opposition, elections present an opportunity to highlight the shortcomings of the incumbent government and offer an alternative narrative towards various policies. In a sense, the elections have the potential of acting as a reality check. As citizens, we regularly voice our support or concerns to various initiatives (or the lack of them!) of the government. At times, we feel frustrated that our voices go unheard. To citizens, elections present a once in five years (subject to certain exceptions!) opportunity to make their voices heard. How can we miss this opportunity? Actually, it is not just an opportunity, it is our duty towards the nation. In a crowd of conflicting noises and opinions, it is easy to get disillusioned, either due to disagreement with policies or inability to see immediate outcome of the policies. At the same time, not having many superlative alternatives may also make one think whether there is really a choice and whether one vote matters? Having an election day near a weekend may entice one to make simple choice of enjoying a vacation. For the sceptics who believe that one vote may not matter, let me remind them that each drop builds up the ocean. As accountants, we like numbers. So let me draw up some eye-opening statistics from the General Elections 2014 – in a whopping 524 constituencies, the vote margin of the winning candidate was less than number of voters who did not turn up for voting. While it is too ambitious to assume that everyone from the nation would vote, even if 50% of the non-voters would have additionally voted over and above those who actually voted, 427 constituencies could have reported a different scenario since the vote margins there were less than even 50% of the non-voters. Dilute this to 25% additional turnout of non-voters, one would still see 240 impacted constituencies. In the past, we have seen political parties with less than these many numbers calling the roost with other coalition partners. In my view, these are eye opening numbers to suggest that the biggest damage is done to the nation by voter apathy. The sum and substance of the message is very clear - Come what may, Vote we must. Closer to our profession, the BCAS had the opportunity of an interaction with the newly elected torch-bearers of the Institute-President Shri Prafulla Chajjed, Vice President Shri Atul Kumar Gupta and Chairperson of WIRC Smt. Priti Savla. The meeting was very fruitful and many issues of topical interest were discussed. BCAS congratulates all of them and reiterates its commitment to complement the efforts of the Institute towards long term development of the profession. The month of March witnessed varied activities and events at the Society–starting with an RRC on Ind As, followed by two lecture meetings covering recent decisions in direct taxes and Banning of Unregulated Deposits Scheme respectively, a series of study circle meetings and workshops, a four-day intensive study course on FEMA, two-day Company Law Conclave and a full-day Tech Summit were events cherished by the members at large. The Society also felicitated rank holders and new entrants to the profession. Acknowledging its responsibility towards the Society, a Blood Donation Camp was organised, which also received good response. 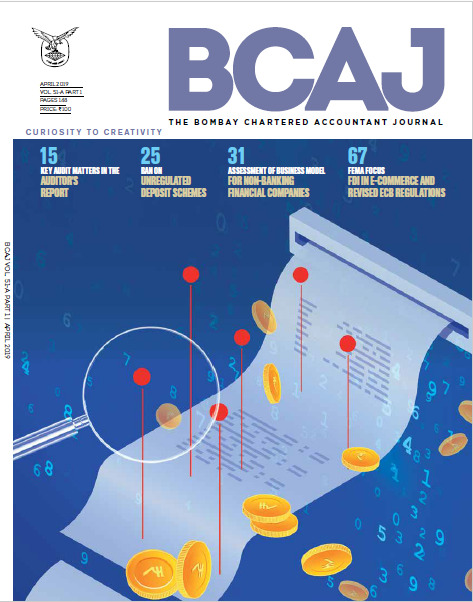 The Journal Committee celebrated the occasion of completing 50 years of the BCAJ with a bang and felicitated various feature writers and editors. Though the financial year has come to a close, the activities at BCAS continue unfettered. The JOSH is high – the organising teams have planned the GST RRC at Vadodara, the Youth RRC is also announced and the preparation for the annual student event Tarang is in its final stages. It is the members’ enthusiasm and whole hearted participation which motivates the organising teams of the volunteers to devote their time, effort and energy to make each event more memorable than the earlier one. I would urge all of you to participate in these events and contribute towards the collective growth of the profession. The membership for the Society was due for renewal by 31st March and reminders were sent a couple of months ago. In your busy schedule, if you have missed out on your renewals, I would request you to kindly renew the membership at the earliest.